When teenagers think of March Break, they often look forward to hanging out with their friends, staying up late watching movies, and rolling out of bed just in time for lunch. For 58 young Sea Cadets, however, that was not the case this year. Each year, a small group of sea cadets is chosen from hundreds of applicants to be sent on the Tall Ship Deployment. Cadets live amongst the crew of one of two tall ships owned and operated by S.A.L.T.S. 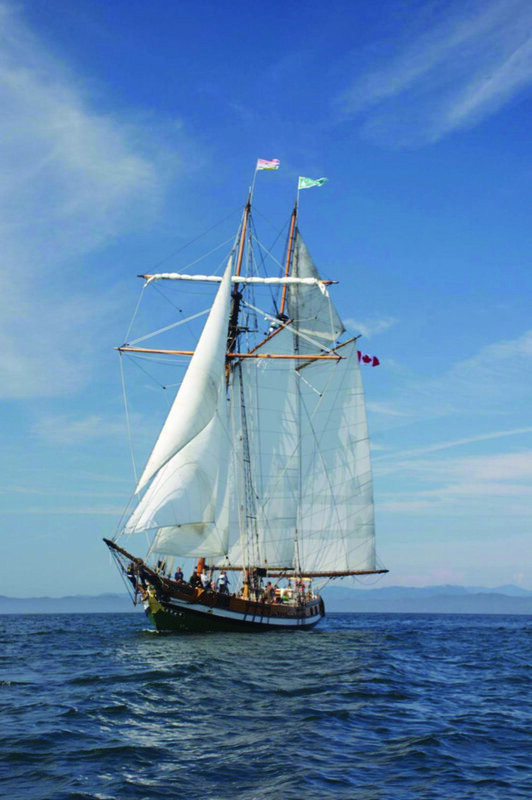 (Sail and Life Training Society) to learn the techniques and skills required to navigate the high seas. The experience allows them to learn new nautical skills aboard one of two ships crewed by a combination of sea cadets, and professional sailors from the Sail and Life Training Society. “I love being a sea cadet. This Tall Ship Deployment is an experience that most people my age will never have,” says JaeHeon Kim from Burnaby, British Columbia, who sailed on a tall ship this year. A tall ship is a large, traditionally-rigged sailing vessel, which is propelled without the use of an engine and requires extensive teamwork and discipline to sail correctly. These tall ships are quite the step up from most sailboats cadets are introduced to. And yet, these young sea cadets are integrated in every aspect of life on the water right from their first day, including lookout, safety, navigation, being at the helm, rigging sails and taking part in the 24-hour watch rotations. While most cadets have never sailed on a Tall Ship prior to this experience, they have spent a great deal of time learning the ins and outs of smaller sailboats. In order to be selected, cadets must write personal essays detailing their past experience and must provide recommendation letters on their overall character and potential for growth on the deployment. Cadet Kendra Dawson from Lethbridge, Alberta, gets a birds-eye view from the top of a tall ship while performing her regular duties. Ambassadors of their communities, these cadets meet for the first time and quickly become comfortable around one another for the sake of completing a task. “On my recent deployment on Tall Ships, I loved meeting all the cadets who were deployed with me. It’s always fun to hear stories from across Canada and to share my own culture,” said Nolis. Parents would be surprised to hear that, depending on their assigned watch, their duties could include keeping the ship clean by scrubbing the decks and polishing the brass on the ship to keep it presentable. When the cadets were off-duty, they continued to learn the different aspects of sailing such as navigation, safety on the water, the different technical parts of the ship, and sailing terminology.